Hydrogen Bomb Yoyo TrickThis trick is called the Hydrogen Bomb, and it looks like this. If you were paying attention you may have noticed that the last few elements of the trick were just a couple of flips. We will tack those on at the end. We are going to spend most of this video just talking about the first part of this trick. That is what is really unique about it. 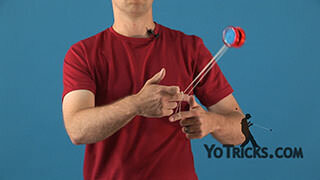 To start this trick you want to start with what is called the Hydrogen Mount. Aptly named because it was named for this trick, I assume. 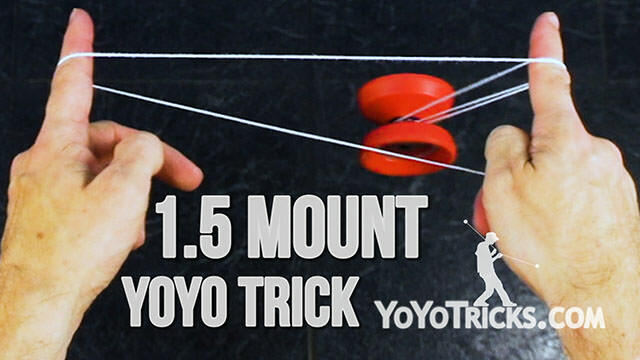 The Hydrogen Mount is really just a One and a Half Mount but instead of catching the yoyo away from your body, you are actually going to bring the yoyo on the inside of the string and mount the yoyo right here. It is a little bit awkward at first. You want to bring the yoyo, flip it so that it kinda comes over your finger just like this, and then you are going to stick your first finger right in front of it and have the motion carry it over so that it lands right on that string. Just like that. 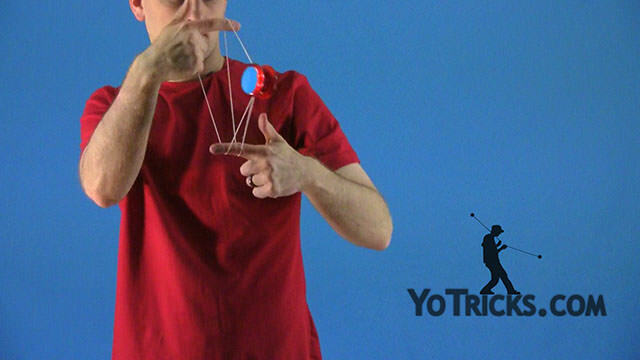 Once you get the yoyo here, the rest of the trick is not too complicated. You are going to bounce it right over your finger on your opposite hand. Then you are going to take your opposite hand and push it into this string again. You can see that there are two strings. There is the string that goes to your yoyo finger, here, and then there is the other string that is connected to the yoyo. 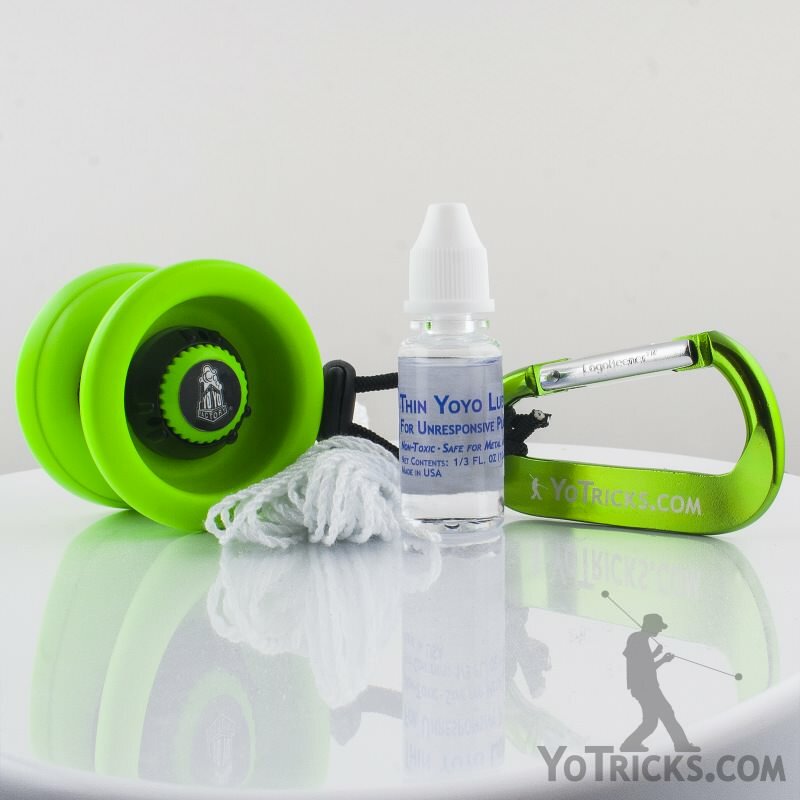 You want to roll it onto the string that is connected to the yoyo. So you are going to go under and then you are going to go right onto this string here. When you do that, all you do is let the rest of the strings off your finger so you only have the string on your opposite hand and then on your yoyo hand. Then all you need to do are a couple of flips to finish the trick. You want to do one reverse, then a flip forward, and then a reverse dismount and that finishes the trick. So here it is one more time: The Hydrogen Bomb.